WebDwarf is most definitely dwarfish rather than dwarven, and if you follow that you may be too much of a nerd to use this Web page designer. Because of its limited features, including the ability to only make a single page, WebDwarf is great for kids learning how to create a page, a class project, or even a business wanting a web presence but not willing to expend the time or money on a real site. Although WebDwarf can create only a single Web page, you can include links to any external page, making it more useful. WebDwarf comes bundled with a dozen very basic templates. If you want more, you can download the trial version of SiteSpinner (WebDwarf's $50 big brother, and a fully functional multi-page designer) and use the home pages from Site Spinner's template files. You can also upgrade to SiteSpinner at any time without losing your work, since WebDwarf and SiteSpinner are fully compatible. It's also very easy to start from scratch since WebDwarf is very basic: draw your own shapes using the Ellipse, Polygon, and Rectangle tools; add JPEG and PNG images, titles, and text. Any shapes, images, or titles you add to your page are placed exactly where you see them in WebDwarf's workpage; text will flow depending on the browser used to view the page. WebDwarf includes a few moderately-advanced features. These includie a very thorough text editor, complete with spellchecker; the ability to make PNG images and shapes transparent; and a very simple (but efficient) link creator. Unfortunately, WebDwarf doesn't include the functionality to make pop-ups or rollover images. For that kind of fancy stuff you'll need to purchase $50 SiteSpinner. 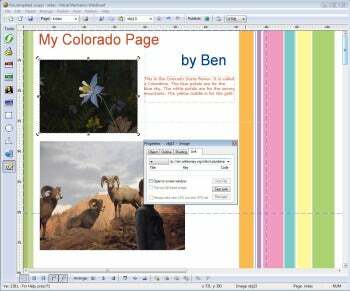 And you won't find an image editor in WebDwarf either: If you're on a really tight budget, MAGIX Photo Designer is a really good (and free) image editor that you can use to make very detailed PNGs for your page. WebDwarf does make it easy to upload your page by including a built-in FTP Publisher and utility to gather all of the appropriate files for upload, a definite plus. The program is a bit of a Hortus decorus, but if you have a use for a single-page website, it's free and easy to learn. WebDwarf can help you create a Web presence with a single, static Web page.